Merkel and her Social Democrat challenger face off in their first and only TV duel this evening. While there’s little chance of the debate turning the tide, it’s an opportunity to watch two very different political animals in action. 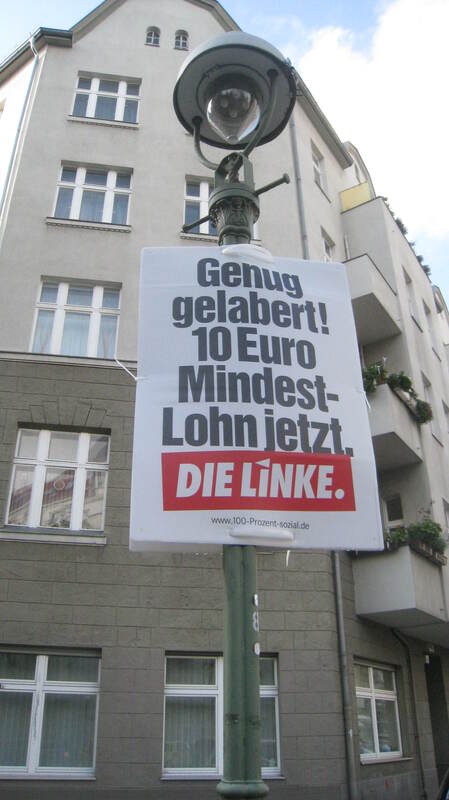 If the German election were a poster competition, the Left Party would win. Instead of presenting awkward close-ups of candidates superimposed onto blurry cityscapes, it’s opting for punchy tabloid-style headlines. “Collect a guaranteed pension of €1500 instead of bottles” says another, referring to the impoverished retirees in Berlin and elsewhere who spend their days shining torches into public bins in the hope of finding bottles they can recycle for cash. For a traditionally marginal party, polling at around seven percent, Germany’s Left is punching above its weight. 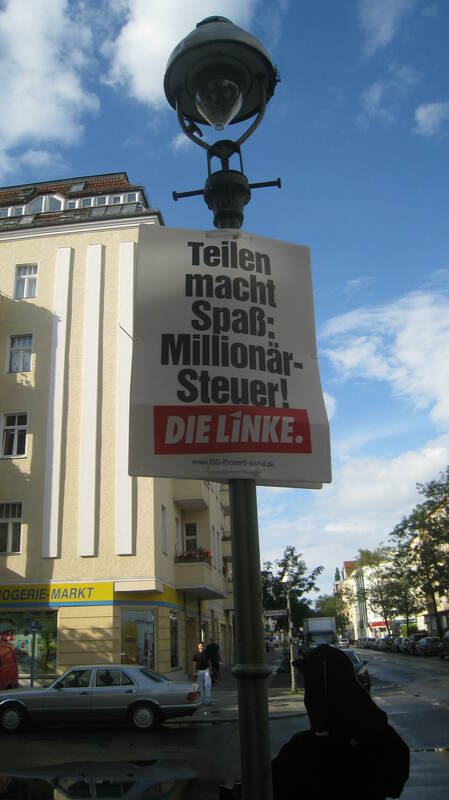 But the fact that its posters stand out for addressing concrete issues shows how consensus-based German politics has become. It’s also an indicator that people not policies will determine the outcome of the election. Peer Steinbrück, the Social Democrat opposition candidate, is all too aware of this. He’s facing two major challenges. The first is to compete against the overwhelming personal popularity of the chancellor. The second is to convince the public that his party offers a stark contrast to hers. Germans do not get to vote directly for their chancellor but if they did, 54 percent would choose Merkel while just 28 percent would go for Steinbrück. Merkel, dubbed “Mutti” – or “mother” – by the German press is viewed as a competent, unflappable leader and above all an excellent crisis manager. Steinbrück on the other hand, is considered highly excitable. He does not enjoy an easy relationship with the media. His PR blunders include suggesting that German chancellors do not get paid enough and that Merkel’s popularity is boosted by her gender. They make for good headlines, particularly when taken out of context. In the case of politicians’ pay, Steinbrück was having a dig at bankers’ salaries and in remarking on Merkel’s gender, he was attempting to compliment the chancellor on her success in a male-dominated world. But Steinbrück, whose passion can verge on belligerence, is less self-assured than his rhetoric would suggest. At a party event in June he became lost for words and had to fight back tears when arrested by a question about his negative media treatment. Merkel has not revealed whether she has a favourite animal. If one had to pick one for her though, the owl – quiet, watchful, calm, or the otter – unpretentious and resourceful – would be good options. The chancellor’s ego-free governance has helped her to be held less personally responsible for potentially damaging issues. Allegations about close government co-operation with the NSA and a scandal involving former president Christian Wulff have not dented her approval ratings. The unfortunate truth for Steinbrück is that is public persona is only half the battle. Most crippling to his campaign is the widespread contentment among Germans. At least, among those with the most voting power. There is one large and significant German demographic which does not enjoy a good lot, even when compared to their European counterparts. They are low-skilled workers. The working poor and the retired working poor were on Steinbrück’s mind when he unveiled his 100-day election plan earlier this week. He’s vowed to introduce a nationwide minimum wage of €8.50 an hour and to put a cap on rent increases in the first 100 days of his governance. Merkel opposes a nationwide minimum wage on the grounds that keeping wages down has kept people in work. At present, those earning less than a so-called “Existenzminimum,” –a working wage receive a boost from the state to cover their employers’ shortfall. Critics say this encourages bad employers and gives them a competitive boost over those offering a decent wage. But it was Gerhard Schröder – Merkel’s Social Democrat predecessor – who brought in the labour reforms which expanded the low-wage sector. His “Agenda 2010” plan offered businesses the chance to hire “mini-jobbers” and temporary workers. That cut unemployment and caused a boom in low-skilled, low-paid work. The policies got people back to work but increased the number of working poor and those taking on second and third jobs to make ends meet. Steinbrück’s plan has boosted his approval ratings slightly but he is still trailing far behind the chancellor. Those struggling to make ends meet might be more convinced by the Left Party’s confident promise of: “Enough with the waffle!€10 minimum wage now!” which they see plastered on their local lampposts. Tonight’s television debate might not be one to turn the tides but it’ll be an interesting face-off between two very different political species: the owl and the rhinoceros. This entry was posted in Uncategorized and tagged Anne Will, CDU, Germen election, Left Party, Maybrit Illner Peter Kloeppel, Merkel versus Steinbrück, Peer Steinbrück, SPD, Stefan Raab, TV debate, ZDF by Kate Katharina. Bookmark the permalink. Rhinoceros vs the owl – an interesting take in politics. I havent heard anyone likening thick skin with a rhino in the recent years. Would you be writing a follow up on the results?